Your Next Stamp is about to turn ONE, and to celebrate, YNS is holding a fabulous birthday blog hop on August 5th! Talented friends of YNS will be joining the Starlets for the hop where they will be showcasing new and old stamps, and of course there are some amazing prizes to be won! In the run up to this spectacular event, Karen is holding a pre-hop Blinkie Contest. Hop on over there to read all about how to enter and you could win a special new release stamp prize package! I used Daisy with Flowers and a sketch from Friday Sketchers (which also has a gift certificate prize this week). Daisy was stamped and colored with Copics, then I paper pieced part of her dress and her headband. I hand dyed the seam binding and made the little roses myself out of tiny milk bottle Prima flowers (remember those from AGES ago?!) I used a Fiskars border punch to make the scalloped edge, then stitched all around that panel. I embossed the background with the Cuttlebug Birds N Swirls folder and added some die cut grass, a tag and some little half pearls to finish it off. I hope you like it and TFL! It's time for another La-La's Weekly Wednesday Challenge! I'm so excited to be hosting this week and I've chosen to challenge you all to make a shaker card! When I first started stamping many years ago, it was because I saw a guest on the Carol Duvall show make a shaker card! I ran out right away and bought a bunch of supplies (including a heat gun and embossing powder!) to make my own shaker card. It was pretty ambitious for a first project and came out pretty terrible, but it started me stamping so I'm glad I did it! Since then I've made a bunch of shaker cards and they're much easier to do than that first one! I used Princess Lala and my Cricut (I had to dust it off before using it!). I wanted the Lacy Labels cartridge as soon as I saw it and hubby was so sweet to get it for me! Lala was colored with Copics, and I airbrushed the edges of the circle with my Copic system so it wouldn't be so stark white. I also colored the edges of the foam layers with a Copic so it would match the purple card base. I even cut the foam with my Cricut using the deep cut blade and housing! The rollers smushed lines into the foam when it cut, but after sitting around for a while, the foam puffed back up to normal! Finally I just glued the parts together and added some beads for the shaker part. This card is also for Charisma Cardz - Anything but Square, and Stamp Something - Something Flowery. 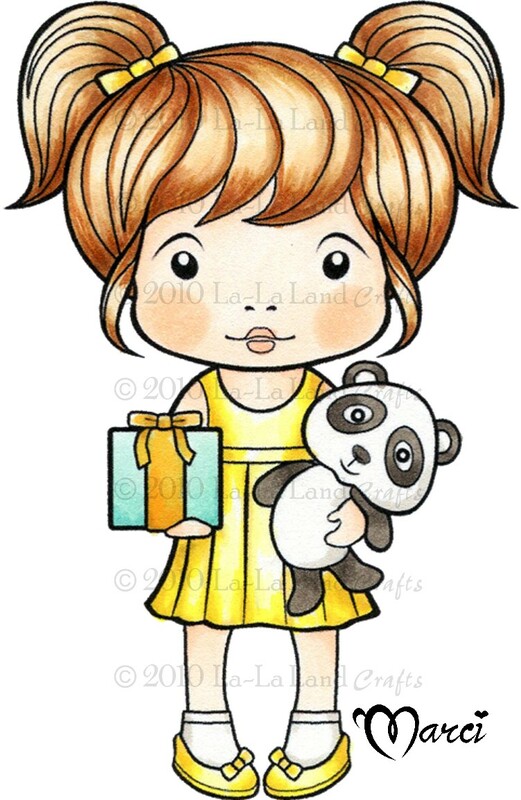 Before I go, I want to let you know that whatever image the hostess uses on her project is 20% off for the week of the challenge, so of course this week it's Princess Lala! La-La Land doesn't really have any Bella-ish images, so I just picked the one I thought was the closest - Pumpkin Lala (which is one of the few Lalas not wearing a dress). Since I wanted her to have an apple and had to cover up the pumpkin in her lap, Lala got the world's biggest apple! lol! I just traced the pumpkin shape onto some scrap paper and modified it ever so slightly to look more like an apple. Then I used that as a pattern to cut the shape out of red cardstock. I added a white colored pencil highlight and then covered the whole thing in clear dimensional adhesive for shine. Since the skin tones on the book cover are brownish grays, I colored Lala with the warm Gray Copics. She was then cut out and mounted on foam boosters. 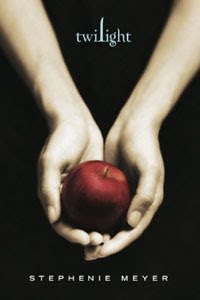 I cut a slit above her legs to put the apple in over the pumpkin. For the white heart, I stamped repeatedly with a swirl from There She Goes, and then sponged a mixture of black and linen distress inks (to get a warm gray color) on the edges and also roughed it up a bit with my scissors. I dyed the seam binding with a similar mixture of distress inks and scrunched it up until dry. I put together a bunch of stuff from my stash to make the beaded head pins and poked them through the seam binding to hold them in place. Finally, I printed a sentiment using the Twilight font (which is actually called Zephyr), cut it into a flag and glued on a tiny red heart rhinestone. I hope you like it! 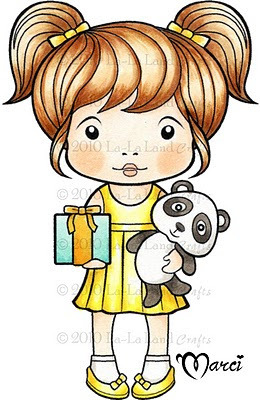 Before I go, I want to let you know that whatever image the hostess uses on her project is 20% off for the week of the challenge, and this week it's Bubble Lala! I used the really old FTL #6 (it's so easy to find old FTLs I'd like to use now that they're all grouped together in PDF format - thanks Natasha!) and of course the colors for this week's Throwdown - Regal Rose, Certainly Celery, Real Red and Baja Breeze. When I was gathering my cardstocks, I was certain I didn't have any Baja Breeze, but when I looked in my file cabinet, there was a whole unopened package! Yay for forgotten stash! I used my new A Little Argyle set from Papertrey Ink over all the little squares to give them interest and tie them all together, then I used some PTI twine to literally tie them all together! The sentiment is from PTI's Simple Little Things Anniversary set. This card is also for CAS-Tastic Challenges - make a CAS card using Kraft. I hope you like it and TFL! I have a Your Next Stamp card for you today! YNS is sponsoring this week's Sketch For You To Try and there is a really great prize up for grabs!! Check out Jen's blog for all the details! I wasn't sure I'd even get it done because I've been really sick the past few days, but I worked on it last night and am pretty happy with it! I stamped Flying High Fhiona (who also comes in a mini version), colored her with Copics, paper pieced her dress and balloon and popped everything up on foam boosters. I added a Prima flower with a little half pearl to her hair and some old letter stickers from my stash. I hope you like it and that you'll play along with us! If you're looking for the Your Next Stamp Challenge #20, it's the post directly below this one. Thanks! It's time for another La-La's Weekly Wednesday Challenge! This week our theme was chosen by Kristine and is to make a Step Card - it can be a regular step card, a side step card, or even a double step card. 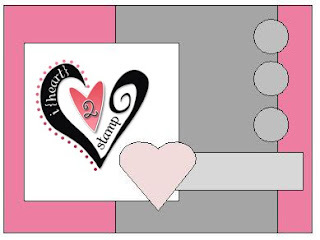 If you're not sure what a step card is, please check out the La-La Land Crafts blog for some helpful links! Hey - why not go there anyway and check out all the completely awesome DT sample cards! 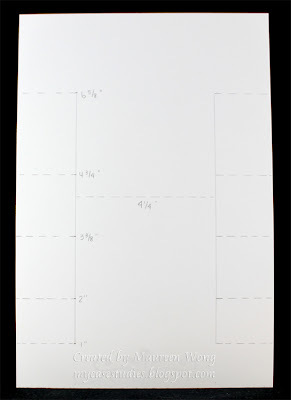 The cardstock is 5.5" x 8.5": score/fold on all the dotted lines and cut the two solid lines. In case you can't see the side measurements, they are 1", 2", 3 3/8", 4 3/4", and 6 5/8". And then the middle fold is at 4 1/4" - make sure you only score between the 2 cut lines! Don't fold the entire card in half or it won't work! I tried to make the steps go up in even increments, but couldn't do it exactly otherwise the measurements would have been really crazy! Rosie's dress was paper pieced and the rest of her was colored with Copics. I stamped 3 extra sunflower heads, colored with Copics and cut them out. Their stems are just thin strips of the same green cardstock as the "grass." Both the blue and green patterned cardstocks are old Fancy Pants journaling cards that I've had forever. The butterflies are Martha Stewart punches glued to wire. I'm also entering this card into Charisma Cardz - creations with something metal on it (wired butterflies) and Allsorts - Create a Scene. Before I go, I want to let you know that whatever image the hostess uses on her project is 20% off for the week of the challenge, and this week it's Lala on a Swing! Yay! I have another Your Next Stamp Challenge today! Our hostess is Angela and she has picked the theme "Flower Power" - use any flowers of your choice: papers, embossing, punches, etc. I used Fairy Fhiona, a sentiment from Mini Greetings, and some really old papers from Memory Box. I made a couple different flowers for this card. The flowers in Fhiona's hair were each made from 2 tiny Prima flowers and a small half pearl. I just glued the pearl in the center of one flower, scrunched the petals up around the pearl, then glued the whole thing onto the other flower. The other flowers were made from hand-dyed and scrunched seam binding. I did a loose running stitch on one end of the binding, gathered and arranged the pleats until I liked the look of it and took a few stitches in the center to hold its shape. Finally I stitched the bead cap on just to make sure it was secure and glued a half pearl onto the cap. I used a single strand of embroidery thread to attach the sentiment tag to the ribbon, then threaded seed beads and little pearls on the ends of the thread.